At first glance the Meizu MX 4-core's gallery looks similar to the Gingerbread Android gallery, but it's actually a custom-made app. It stacks images from folders just like the regular app, but this is about where similarities end. Inside the folders, images are arranged in a rectangular grid. You can email, share (via Bluetooth, MMS) or delete multiple images by picking them one by one from the grid after you tap and hold on a photo. When viewing a single image, a tap on the screen will display the available options. You can Share, Crop, Delete, Set Wallpaper, Rotate, Open in Image Editor and view Details. 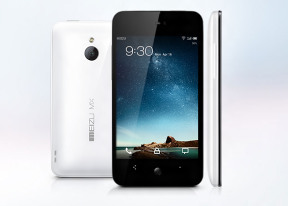 The Meizu MX 4-core comes with a dedicated Video app, but it expects videos to be placed in a certain folder. You can use the file browser to get videos to play from elsewhere - it offers thumbnails and everything so we ended up using it more often than the Video app itself. Once you get into the player, things really start to look up. The player handled all the DivX, XviD and H.264 files we threw at it trouble-free (in .AVI, .MKV and .MP4 containers) and resolution didn't matter either - 1080p videos played without a hitch. The audio codecs weren't a problem either. You also get a lot of nice options - a dedicated brightness setting for the video player and lock UI key. You can zoom in and out with pinch gestures. If additional audio streams or subtitles are available you'll get additional icons on the display for more settings. Note that Chinese and English fonts are supported only. With the MHL connectivity, the Meizu MX 4-core turns into a very capable video player. Even without it, at 4" big and with 960x640 resolution you can enjoy 720p videos reasonably comfortable though the 3:2 aspect ratio of the screen will involve some cropping if you want to use all the pixels. Still, the much larger 16:9 HD screens of the MX 4-core competitors do a far better job for watching videos on the go. Just like the video player, the music player can only find tracks located in a specific folder. You can browse your collection the traditional way or you can select to have it filtered by folders.. The music controls are at the bottom of the screen, with a small album thumb. If you tap on the album art you'll get to the full-screen Now Playing interface featuring repeat and shuffle buttons, playback controls, a volume slider and a scrubber. The middle section with the full-size album art is side-scrollable: you can swipe to the left or right to display the current playlist or the lyrics karaoke style. You can access the equalizer from the advanced menu. It features several presets, which you can edit manually. If the music player is working you'll get music controls on the lockscreen - there're always available in the task switcher too. The music player also has a play timer, which will turn it off automatically in 5 - 60 minutes. The Meizu MX 4-core went off to an impressive start in our audio quality test. When attached to an active external amplifier, the smartphone did impressively well, with the average intermodulation distortion remaining its only non-perfect score. 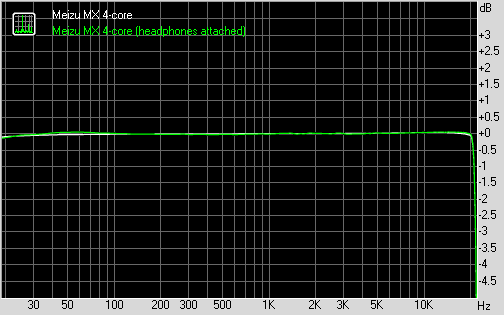 The MX 4-core also turned out to be pretty loud, unlike its predecessor. Another difference between the two MX generations is the headphones on performance. While last time around we saw a huge drop in performance when we plugged in the set we usually use for testng, this time around the degradation was limited to some extra distortion and stereo crosstalk. It's an ideal performance, but it should be as good as ideal for everyone, but the most demanding audiophiles out there.